Francoise Charlotte David, the 3rd daughter and 8th child of Jean Pierre David and Marie Madeleine Monmillion, was born at Louisbourg on 10 April 1729 and baptized the following day, 11 April 1729. Francoise's godparents were Francois Ganet, contractor for the work of King in this city and Francoise Aubert Charlotte, wife of Monsieur De La Perelle, Lieutenant D’ Urie company of the garrison. Fre Zacharie Caradec, Commissioner Recoleta Missionaries from Brittany and Parish Priest of Louisbourg presided at the baptism. The witnesses attending Francoise' baptism was Rene Seanoir. It is quite possible that Francoise later adopted her godmothers name, Charlotte, by which she is refered to in numerous later abstract documents. Francoise Charlotte’s life story is probably one of the most interesting and well source documented of the Jean David children between the years 1729 and 1771. The 1734 Louisbourg Census record indirectly indicates her presence in Louisbourg for that year and her name is listed in the 1749 - 1750 Louisbourg Census. Charlotte married twice but there is no record of her baring any children by those 2 marriages. However, in the later years of her father’s life she is his rock and his primary care giver, as well as, overseer of her younger sister, Jeanne Olive. In 1759, Charlotte and her 2nd husband along with her sister, Jeanne Olive, and his children from a previous marriage are deported to France as a result of the 2nd siege of Louisbourg by the British. Jean Pierre dies during that voyage and the surviving family struggles to make ends meet for a couple of years in Saint-Servan, France. In 1763, the family migrates to French Guyana to start a new life along with a number of other French-Acadian exiled families. However, that venture ends in the tragic death of Charlotte’s husband in 1764. Now in a state of destitution over debt owed by her husband to the crown, Charlotte is forced to leave her sister Jeanne Olive with Jeanne’s 1st husband, and travels back to France in 1765 to seek from the crown resolution and forgiveness of the debt owed. It is believed that Charlotte eventually migrated back to the Saint-Servan / Saint-Malo or Nantes, France areas where it is also believed that the Jean Pierre David family may have originated. A 1771 travel passport to Saint-Malo, issued to a Claire Francoise Pouilly, the 1st daughter of Charlotte’s older sister’s, Marie Josephe, possibly indicates that Claire Francoise may have traveled to Saint-Malo to live with her Aunt Charlotte since the surviving members of the Pouilly family were also struggling for survival in the Rochefort area of France at that time. The last unconfirmed recordings of Charlotte’s whereabouts between 1766 and 1771 are noted in the "General rolls of the inhabitants of Île Royale and Île St Jean" living in Saint-Enogat on the northern coast of France located within 10 to 15 miles of the city of Saint-Malo. Between Francoise Charlotte's birth in 1729 and the Louisbourg Census 1734, the births of 2 more children blessed the David dit Saint Michel household, Etienne Thomas on 21 December 1730 and Louis on 02 September 1732. The last 5 of Francoise Charlotte's siblings to be born at Louisbourg were Claude Thomas born on 20 December 1735, Jacques Andre born on 30 November 1737, Jeanne Olive born on 10 July 1739, Marie Magdeleine born on 16 January 1741 and Jeanne Angelique born on 21 December 1743. 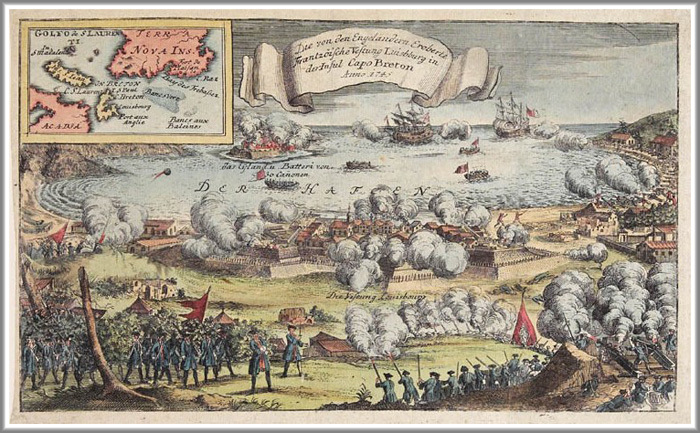 After the 1st siege and capture of the Fortress of Louisbourg on 16 June 1745 by British forces commanded by Sir William Pepperell during the War of the Austrian Succession, it is believed that Jean Pierre, Marie Magdelaine and their children left Louisbourg but it is not known if they were deported to France by the British with most of the other Louisbourg French-Acadian inhabitants or escaped to Acadie or one of the Quebec, Nouvelle France communities along the St. Lawrence River. During this period between 1745 and 1748, it is unclear where 5 of Jean Pierre and Marie Magdelaine's children may have spent these years. It is highly likely that Michel, having just been married in 1744, was living in Grand -Pré, Acadie with his new wife, Genevieve Hebert. However, the whereabouts of Marie Josephe, Francois, Jacques Andre and Jeanne Angelique during this period are unknown. The Fortress of Louisbourg Archives Family Reconstitution File based on the Louisbourg 1749-1750 Census indicates that these 5 children were not living with Jean Pierre and Marie Magdelaine after they were repatriated to Louisbourg in 1748 from their exile. On 27 November 1752 at the age of 23, Francoise Charlotte, daughter of Jean David and of Magdelaine Monmillian, native of Louisbourg, Diocese of Quebec married Nicolas Colin, son of Noel Colin and Marguerite Picard, native of the Parish of Saint Marie of the Temple, Archbishop of Paris; gunner by profession. Publication of two bans and waiver of two others are noted on the marriage record. Fre Patrice LeGree presided at the marriage. Witnesses attending the marriage included Francois Viette dit LaPlume and Francois Millien. Other signatures noted on the marriage record included Nicolas Colin and Francoise Charlotte signed with an "X". On 17 November 1757, Charlotte's 1st husband, Nicolas Colin dit Saint Lionnon, at the age of 35 years, died at the Hospital of Louisbourg. He was a native of the diocese of Paris, parish of St. Mary. Nicolas' profession was a foundry worker and a soldier of the company of St. Mary. He was the son of Noel, a professional domestic, and of Marguerite Picard who were engaged in Rochefort, 1 May 1735. It is confirmed that Nicolas was a soldier and cannoneer at the Louisbourg garrison in the company of Saint Mary and it is confirmed that he died in the hospital at Louisbourg. Therefore, it is possible the he may have died from wounds received in one of the many military attacks by the British on the Fortress occuring during the British's Louisbourg Expedition of 1757. However, there is no confirmed source at this time that supports this assumption. Now a widow with no children to take care of, Charlotte, the oldest daughter at home, most likely turned her attention to caring for her father, Jean Pierre, and his household. He was now 64 and probably not actively working as a blacksmith. His wife, Marie Magdelaine had died just 2 1/2 years earlier. Between his still morning of her death and the stress of events at Louisbourg at the time, the strength of Charlotte's support to the family would be desparately needed over the next year and a half. On 26 July 1758, the British finally succeeded in capturing the Fortress of Louisbourg during its 2nd and final siege. The terms of that capitulation of the fortress mandated that all captured military personal and remaining Acadian inhabitants be immediately deported to either England or France. Exactly how Charlotte dealt with this tragedy and what transpired over the next 9 months will never be known but accept the challenge ot take care of the remaining family she did. deported / exiled on Jean Baptiste's ship the Marie Francoise ......... talk about attempting to sell the ship to Louis XV agent. She needed strength and support for her family to survive. She needed another husband. How and where did she meet Jean Baptiste? Through her fathers trade as a blacksmith? On 28 April 1759, Charlotte, her new husband, Jean Pierre DeBroise, his 2 children, Marie and Guillaume Andre by a previous marriage, Charlotte's younger sister, Jeanne Olive and Jean Pierre make their initial arrival at the port of La Rochelle, France on their way to their final destination at St Milo on 17 September 1759. The original source manifast recording these arrivals in France confirm their occurance. Unfortunately after close review of the passenger manifast, and if truth be known, it appears that Jean Pierre is listed in a group of passengers that may have died during this voyage and were "mort en arrivant", i.e., "dead on arrival". The 1759 passenger manifast is the last original source recording uncoverd to date of Jean Pierre. 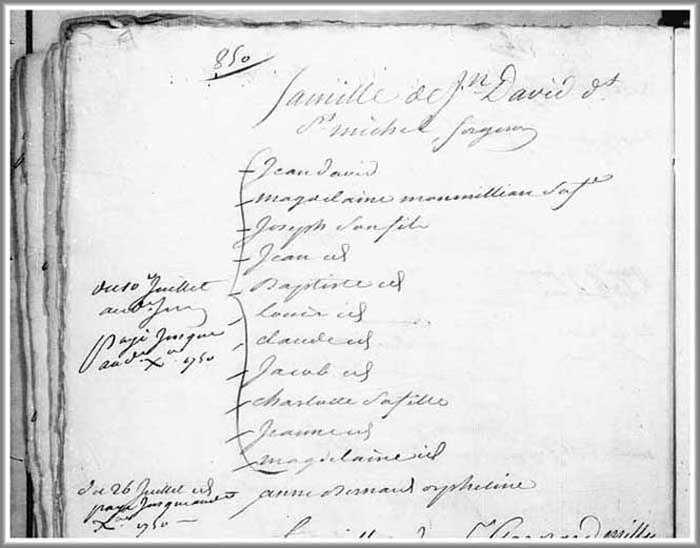 Other, abstract recording of Charlotte and her family in a 1762 Census of Acadians in Saint Milo or Saint Servan, France do not reference Jean Pierre. However, Jean Pierre is referenced in the Cayenne, French Guyana 1764 abstract marriage record of his 4th daughter, Jeanne Olive to Seiur Pierre LeClerc and the 1768 abstract marriage record of Jeanne Olive to M. Guillaume Pacquenault. The 1764 abstract is vague as to whether Jean Pierre was alive at the time of this marriage. However, the 1768 abstract indicatest that both Jeanne Olive's father, Jean David and mother, Marie Magdelaine Monmillion, were deceased. On their way to their final destination at Saint-Milo on 17 September 1759. The original source manifest recording these arrivals in France confirm their occurrence. However, Jean Pierre is referenced in the Cayenne, French Guyana 1764 abstract marriage record of his 4th daughter, Jeanne Olive to Sieur Pierre LeClerc and the 1768 abstract marriage record of Jeanne Olive to M. Guillaume Pacquenault. The 1764 abstract is vague as to whether Jean Pierre was alive at the time of this marriage. However, the 1768 abstract indicates that both Jeanne Olive's father, Jean David and mother, Marie Magdelaine Monmellian, were deceased. At sometime between the death of Nicolas and 28 April 1759, Charlotte developed a relationship with Jean Baptiste DeBroise, a master blacksmith, and married. No record of this marriage has been yet uncovered. After the 2nd siege of the Fortress of Louisbourg and the deportation of all French Acadian inhabitants to France, Charlotte, age 31 years, and Jean Baptiste, age 41 years, are listed as arriving in La Rochelle in 28 April 1759 as husband and wife. Accompaning them on this voyage were Jean Baptiste's children from a prior marriage, Marie, age 14 years, and Guillaume, age 10 years, and Charlotte's younger sister, Jeanne Olive, age 19 years, and Charlotte's father, Jean Pierre. Francoise Charlotte's documented presence in Louisbourg is recorded in a Family Reconstitution File of her father, Jean Pierre David, which is archived at the Fortress of Louisbourg National Historic Site of Canada. This Family Reconstitution File was abstracted and compiled from original source documents archived at the Archives of Canadian and the Archives Nationale. Further documented evidence which notates Francoise Charlotte in Louisbourg during this period has been extracted and compiled from original source documents into the Fortress of Louisbourg Historical Memoranda Series 1964 to Present H F 25 1989 titled Jean Pierre David dit Saint Michel: Blacksmith authored by Eric Krause of Krause House Info-Research Solutions. A Family Reconstitution File for the family of Nicolas Colin and Francoise Charlotte David has been researched, abstracted and assembled from original source documents dated between 1751 and 1758 and is available on the research website for the Fortress of Louisbourg National Historic Site of Canada. To date, only one original source document has been uncovered that documents a Francoise Charlotte as godmother at a baptism at Louisbourg in 1757. Jacques Charles Pouilly, 2nd son and 2nd child of Jean Paul Pouilly and Marie Josephe David, was born on 31 December 1753 in Louisbourg and baptized the following day, New Years Day, 1 January 1754. His godparents were Jacques Doulliez, and Francoise Charlotte David, Marie Josephe's sister. 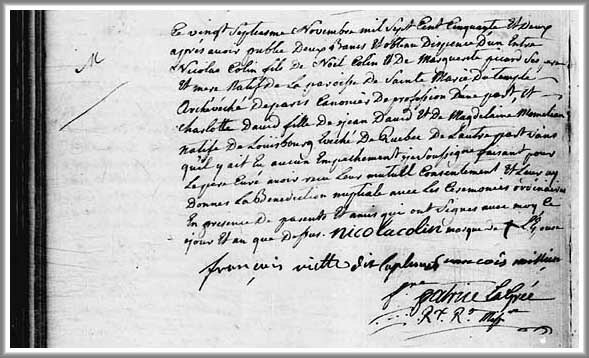 Signatures attending the baptism included Nicoles Gotirn and Nicolas Colin, the husband of Francoise Charlotte. Fre Isidore Caulet presided at the baptism. On 28 October 1757, Charlotte David is recorded as godmother at the baptism of Bernard Charles LeBlanc, son of Nicholas LeBlanc and Genevieve Amien, born the previous day, 28 October 1757. The child's godfather was Bernard Metzker. Fre Pierre D'Alcantara Cabaret presided at this baptism. Witnesses attending the baptism were recorded as Micsoll Andlauer, Bernard Metzker, Nicolas Colin and Francois Ducla. Nicolas Colin dit Saint Lionnon, believed to be born in the diocese of Paris, parish of St. Mary about 1722, was a the son of Noel Colin, a professional domestic, and of Marguerite Picard who were engaged in Rochefort, 1 May 1735. Nicolas was a foundry worker and a soldier of the company of St. Mary. He died 17 November 1757 at the Hospital of Louisbourg. There exist no uncovered record that Francoise Charlotte and Nicolas had any children.